Craig O'Shannessy is widely respected as the No. 1 strategy expert in the world. Craig is the strategy analyst for the ATP Tour, Wimbledon, the Australian Open, Team Djokovic and The New York Times. Enter Your Email Below To Join The Newsletter & Improve Your Tennis Game! Watch the video below. Big data finally meets the dirt! Learn More & Purchase Dirtballer! Craig works at the elite level of our sport & passes that expert knowledge on to you. Craig covers all the Grand Slam & Masters Series finals for the ATP World Tour. Craig digs deep into the serve, return, rally and approach patterns at the elite level of the game, simplifying pro strategy on the biggest global stages. This is the beating heart of the next generation of tennis analytics. Craig writes a weekly story on the ATP website focused on new research that quite often is being analyzed for the very first time. Want a new way of thinking? Here it is! Craig is the tournament analyst for [email protected], breaking down the biggest matches at the world's most prestigious tournament. Craig showcases the patterns of play and winning percentages that dominate our sport. Craig’s expert strategy debuted on the Tennis Channel in 2015 in the USPTA Series, "OnCourt with USPTA." The first show focused on serve strategy, while the second highlight winning patterns of baseline play. Craig is the official tournament analyst for the Australian Open. He breaks down the biggest matches on the biggest stages. Craig has delivered his strategic analysis & insights for tennis fans from down under since 2015. Craig has been writing for the New York Times since 2011, providing their discerning readership with a deeper, richer analysis of why why matches are won and lost. Craig's main focus in 2016 is the US Open. Craig is the official strategy coach for the Italian Federation. He spends two weeks a year travelling all over Italy training the High Performance coaches on the new analytics in our sport. 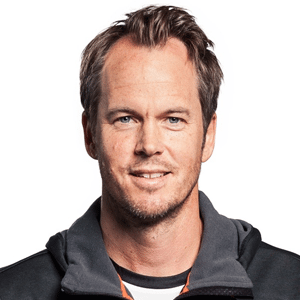 In 2015, Craig was awarded with the Tim Gullikson Touring Coach of the Year award by the USPTA. Craig first started coaching on the pro tour in 1995, and graciously accepted the award at the World Conference in New Orleans. Craig has helped raise my awareness of the game of tennis by making complicated statistics simple to understand and use with the players I am working with. Brain Game Tennis - what an exciting concept! I am so pleased you have decided to move in this direction. From Day 1, I have been a great admirer and proponent of your work. What you do and how you do it so very important to our profession and to the game itself. You have been “right on” from the start! The platform Brain Game Tennis affords to coaches, players and even simply friends of tennis such a valuable resource for an easy exchange of ideas! Keep up the incredible work. Craig sees the game differently. We see chaos. He sees patterns. I have worked closely with him for the past 15 years and have witnessed first-hand how his global influence in our sport has grown. Craig is truly changing the game - specifically by improving the quality of the practice court. We all used to think grinding was the best way to improve. The First 4 Shots certainly changed that! Craig has worked closely with players that I coach full-time, and I always enjoy spending time on court with him. OK, SO WHY BRAIN GAME? Tennis looks like a game of pinball, with the ball careening here, there, and everywhere. But it's not. It's actually the exact opposite. Tennis is a game of repeatable patterns in four specific areas - serving, returning, rallying and approaching. Study the patterns, learn the winning percentages, and make the game simple. That's what Brain Game Tennis stands for. What Can Brain Game Tennis Strategies Do For You? Whether you’re a player or coach, there’s never been a clear path to actually improving at tennis. Should we practice more forehands, backhands, serves or returns? How important is consistency for winning matches? How much time should you spend working on technique over strategy? Where should you serve in singles? What about doubles? Historically in tennis, the answers to all these questions were based on theories NOT backed by data. Now, we have millions of data points on thousands of matches per year. After analyzing this data, you’ll be surprised what you find. For example, practicing extended rallies is mostly wasted time if you want to win more matches. It’s time to completely change the way we play & coach tennis. Craig O’Shannessy has finally taken all this data and created tactics & strategies for some of the top juniors & ATP pros in the world. Bran Game Tennis courses are the only tennis strategies out there that use data to back up the lessons. There are simply no other courses available to the public like this. You’ll finally know exactly what to focus on to take your game to the next level. Whether you’re a singles or doubles player, a college tennis athlete or 4.0 league player, a coach for juniors or pros, these courses will transform the way you think, teach, and play tennis. Craig O'Shannessy has 30 years of coaching club tennis, running junior academies & working on the pro tour. His game-changing tennis strategies are now available to you. Learn his best strategies through these 8 courses that have helped 1000's of people become tennis players & coaches! Join thousands of other tennis players, coaches, and fans. Sign up for the best tennis strategy newsletter in the world. Enter Your Email Below To Improve Your Tennis Game!